Erica Benedikty's Phobe: The Xenophobic Experiments is the kind of film that should not work. A high concept science-fiction action film made on a $250 budget in 1994, Phobe is a marvel of the DIY spirit that astonishingly built itself into a Canadian TV staple over the last twenty years. This unique, low-budget passion project is the kind of film that we all look at and hear the little voice in our heads telling us, "I could do that", but very few of us ever do. Erica Benedikty did it, and the world is a richer place for her effort. Over the course of one long year of shooting, Benedikty wrote, shot, edited, and created visual FX for Phobe: The Xenophobic Experiments. Benedikty had spent much of her youth pretending to make backyard genre films using an 8mm camera with no film in it, and when she grew up, that dream grew up with her. By the time she was a young adult, the notebook sketches and ideas that she'd been making all her life had evolved into the story of Phobe, initially conceived as a slasher film, but eventually completed as a Terminator styled sci-fi action movie. In 1994 she took a job at a local cable station in order to facilitate making her dream come true. Not only was she able to gain experience on the technical side of filmmaking, she was also able to impress her bosses and everyone she knew with her excitement about filmmaking. As a result Benedikty was able to make her movie for next to nothing, wrangling friends and co-workers into helping her for free, not to mention local businesses who provided props, locations, and even catering to the rambunctious production team. It was a slow process, making a movie on a $250 budget means that your schedule has to be pretty flexible, but in the end, the film was far more ambitious than anyone expected. Phobe is the story of a deadly alien who escapes captivity in space and tries to hide from his captors on Earth. This alien, the titular Phobe, is hounded by an intensely mulleted bounty hunter named Dapp (John Rubick). When local high school student Jennifer (Tina Dumoulin) unwittingly stumbles across the Phobe's egg, she finds herself in the middle of a struggle for the survival of the universe. Now Dapp not only has to track down and kill the Phobe, he has to save Jennifer from it's wrath as well. All in a day's work for the galaxy's greatest alien hunter. Whether or not the film itself is a success is largely irrelevant. Phobe is an incredible story of grass roots success that we don't hear very often in the movie business. I'll be completely honest, the first time I watched Phobe I was amused, but not entirely impressed. It wasn't until I sat back down with the disc, went through the supplementary materials, and watched the film a second time with a commentary that it all clicked. This movie is incredibly entertaining given its limitations, and the cast and crew give no hint that they ever consider their project to be handicapped in any way. They had a script and an idea and they made the best movie they could, and it is a ton of fun. Severin Films' direct-to-video imprint Intervision Picture Corp is exactly the right home for Benedikty's magnum opus. The recent DVD release of the film provides mountains of context and some amazing bonus materials that help to bring this otherwise completely unknown film to life. The film as it is presented on the new DVD is a slightly altered version from the one that aired on Canadian late night cable over the last twenty years, but it's hard to tell for the layman. Benedikty went back and improved a few of the visual FX in the film, but not to the point that it looks like a different project. The vast majority of the original visual FX were done using an Amiga computer from the cable station's editing room. Most remain in tact for the new release, but a couple have been cleaned up, most notably a space station shot and a light-saber battle that looks like it was animated using Microsoft Paint. While purists might cry foul, I find it hard to believe that anyone with a heart would begrudge Benedikty the opportunity to plaster over a few of the cracks in her film. Intervision's disc hosts a wealth of bonus material, all of which adds substantially to the experience. Easily the most impressive item on the disc is the 20 minute making-of documentary, "The Making of PHOBE", by Rewind This! director, Josh Johnson. In his documentary, Johnson talks to what seems like every living cast and crew member - sadly John Rubick was killed in an automobile accident in the early 2000's - about the making of the film in depth. All of the cast members are charming interviews, and Benedikty is an especially cheery advocate for her little gem of a movie. One element of the film that is unavoidable is the intense Canadian-ness of the whole project. The accents, the wardrobe, the kind-natured intergalactic bounty hunter, it all points to a particular time and place that is unmistakably Canadian and the film is all the better for it. Speaking of Canadians, the disc also features a full-length commentary with not only the director, but also a couple of heroes of Canadian contemporary low-budget cinema Paul Corupe of Canuxploitation fame, and Peter Kuplowsky, who has not only served as a producer for Astron-6, but also helps to program the Toronto After Dark Film Festival along with shorts at Fantastic Fest, and features at the Toronto International Film Festival's MIdnight Madness section. This trio is a joy to listen to as Erica explains many of the film's quirks while Paul and Peter listen and interject with their own enthusiastic observations. Throughout the commentary, Benedikty drops wonderful little odds and ends about the film's production including her attempts to maintain continuity even as the seasons changed behind her performers on-screen, the time her actors had to pretend that a tomato was a grenade, and the crew's enthusiasm upon discovering the glory of the flash-pot to create explosions. This is one of the most fun commentaries I've had the privelege of listening to in a while and I highly recommend it. The disc keeps the hits coming with a full collection of extra features beyond the above mentioned highlights. Intervision has also included Benedikty's first feature, Back in Black, which was made to prove to her financiers (bosses at the cable station) that she could make a real movie on the kind of budget they were offering. We also get a reel of outtakes, the original FX shots as they were seen on late night Canadian cable, and a wonderful Q & A following a home town screening of the film in St. Catherine's, Ontario in which the surviving cast and crew relate some great stories about the film in typically upbeat Canadian fashion. The final extra is one of my favorites, even though it is very short and relatively minor, and that is performance footage of local band Gribble Hell performing the PHOBE theme song over the film's opening credits. It's short and crammed into one corner of the screen, but it's the kind of oddity that always makes me smile. 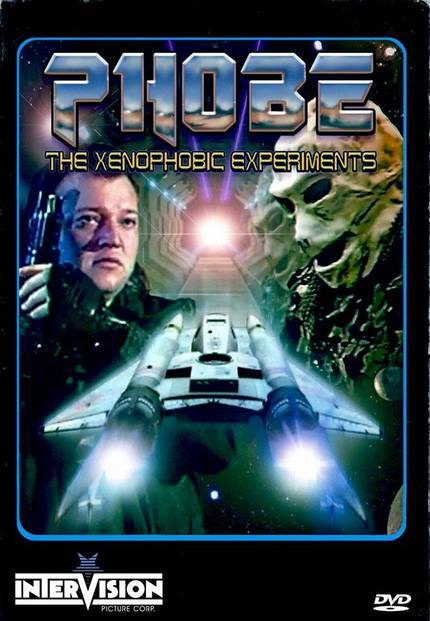 Phobe: The Xenophobic Experiments is the rare film that takes you completely by surprise and leaves a huge smile on your face. In these days when films are marketed and focus grouped to death, it's refreshing to see this kind of singular vision on screen, even if the technical aspects leave a bit to be desired. It's a lot of fun, and that's what really matters to me. Highly recommended. 👎 Mr Kuplowsky may have done many things but, as an Astron-6 fan, I can say he's never been credited as a producer with Astron-6. Its true, t'was only an Exec P. for Manborg and an Associate P. for Bio-Cop and Zorb. Never a capital P.
And now I respect you less. One day, I'll get my shot and can finally be the man you always thought I was. Awesome review of Phobe! Thank you so much! I'm so glad people have a good time and enjoy watching Phobe.